The Modern House in America by James Ford and Katherine Morrow Ford, Architectural Book Publishing Co., New York, July 1940. This piece is more a less a romp through the most important pre- and post-war modern house books which will attempt to weave a thread of editorial connections for the much under-recognized Katherine Morrow Ford. 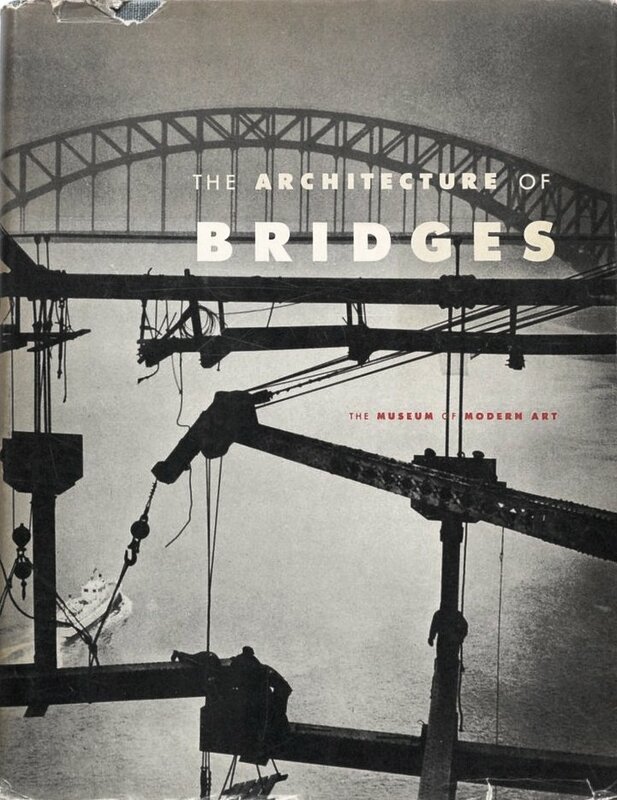 First as a co-author with Harvard faculty member Dr. James Ford, and upon his untimely 1944 death, then with her second spouse Thomas Creighton, editor of Progressive Architecture, her volume of work compiled before her equally untimely passing in 1959 is legendary and her legacy is iconic as I hope this post will begin to portray. "Born in Clinton, Mass. James Ford received an A. B. degree from Harvard in 1905 and an M. A. the next year. He took graduate courses at the College Libre des Sciences Sociales in France in 1906-07 and at the University of Berlin in 1907. He received his Ph. D. from Harvard in 1909. That same year, Dr. Ford joined the Harvard University faculty as an instructor in social ethics. 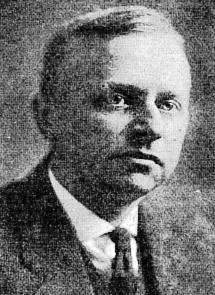 He was promoted to assistant professor in 1913 and to associate professor in 1921. 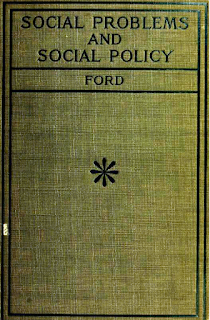 Dr. Ford was manager of the Homes Registration and Information Division of the United States Housing Corporation in 1918-19, associate director of the President's Conference on Home Building and Home Ownership in 1930-33 and had served as a member of the executive committee on hygiene of housing of the American Public Health Association. From 1924 until 1935 Ford also was executive director of Better Homes in America, an educational organization, when former President Herbert Hoover was its president." (USHC Architects, Landscape Architects and Planners, http://web.mit.edu/ebj/www/ww1/Biography-Ford.html, accessed 9-25-2018). 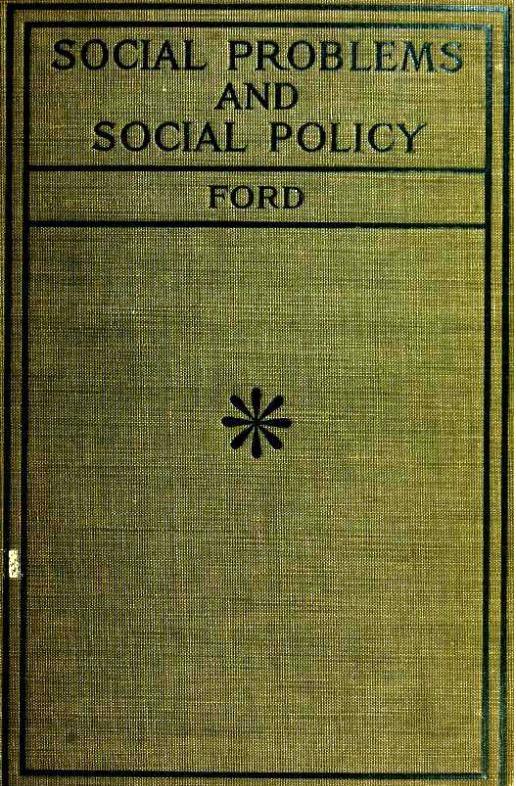 Social Problems and Social Policy by Dr. James Ford, Harvard University Press, Cambridge, 1923. "The mission of the Better Homes in America was to help American families make their homes more convenient and attractive. As more and more communities participated in the local campaigns, activities were concentrated mainly in the following divisions: home improvement, community improvement, urban-rural relationships, and dissemination of information on housing and homemaking subjects. Efforts in these areas were made through the annual campaigns and demonstrations, cooperation with national, state, and local organizations, press coverage, and publications. 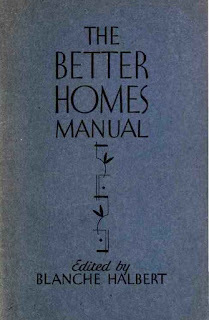 The Better Homes Manual [with an introduction by Ford] was published by the University of Chicago Press in 1931" (see below). 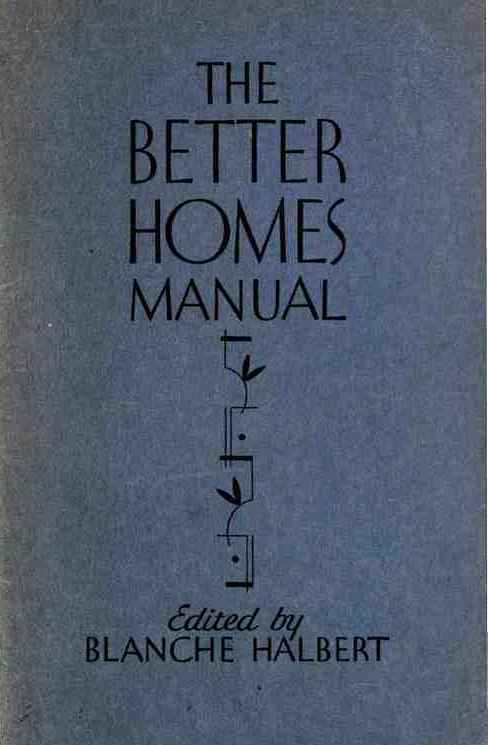 Halbert, Blanche, The Better Homes Manual, University of Chicago Press, Chicago, 1931. Introduction by James Ford. This is likely around the time Ford started his collaboration and with Katherine Morrow which resulted in their eventual marriage. Ford and Morrow could not have avoided crossing paths with Catherine Bauer and Lewis Mumford around this time as they were also deeply involved with modern architecture, Henry-Russell Hitchcock, Philip Johnson and the activities of the Museum of Modern Art and their early housing exhibitions such as 1932's "Modern Architecture: International Exhibition," 1934's "Housing Exhibition of the City of New York," and 1937s "Modern Architecture in England" for which Bauer authored catalogue essays. She also put her growing housing expertise to good use by publishing the widely successful Modern Housing (see below) in 1934 which definitely would have crossed both Ford's and Morrow's desks. Modern Architecture in England, essays by Henry-Russell Hitchcock and Catherine Bauer, Museum of Modern Art, New York, February 10 - March 7, 1937. 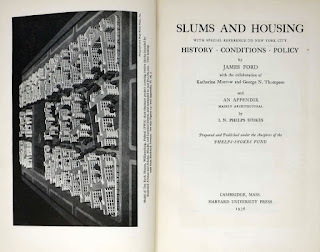 Ford, James, Slums and Housing With Special Reference to New York City History, Conditions, Policy, Boston: Harvard University Press, 1936. Two Volumes. Vol. I: 1-508 pp. Vol. II: 511-1033 pages with index. With the collaboration of Katherine Morrow and George N. Thompson and an Appendix, mainly architectural by I. N. Phelps Stokes. 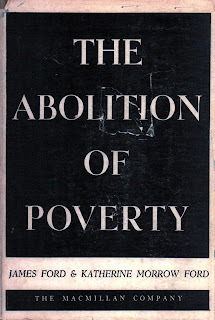 Prepared and published under the auspices of the Phelps-Stokes Fund. 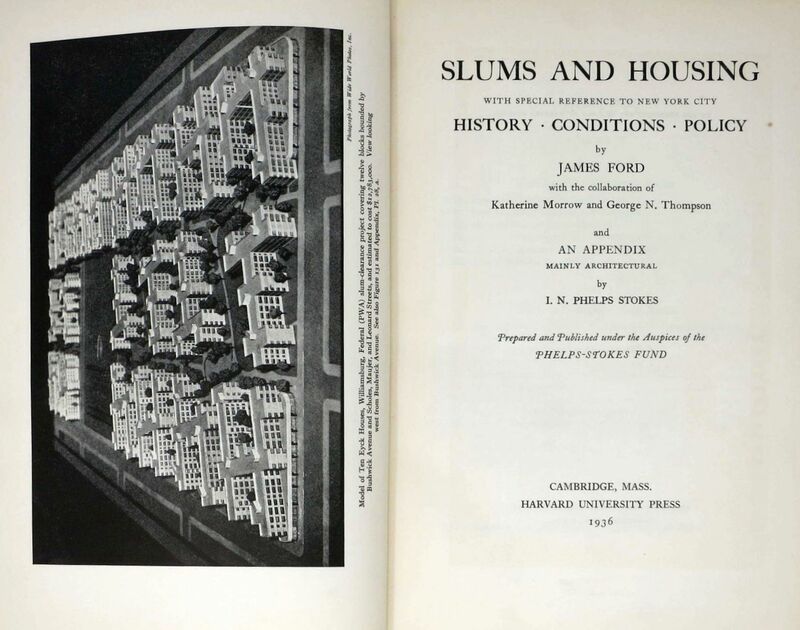 "A leading authority on slum clearance, Ford published a two-volume work Slums and Housing With Special Reference to New York City History, Conditions, Policy, Harvard University Press, Cambridge, 1936 (see above), which he wrote in collaboration with George N. Thompson and Miss Katherine Morrow to sum up their findings in a study of general housing problems and slum clearance. In 1936 Miss Morrow became Dr. Ford's second wife. The New York study, made under the auspices of the tenement house committee of the Phelps Stokes Fund, was aided by the committee on research in the social sciences at Harvard. The investigators wrote that beneath slums lay stupidity and a cruel apathy, and that no solution of the national slum problem could be expected "until the primacy of public interests over private interests in property is recognized." (USHC Architects, Landscape Architects and Planners, http://web.mit.edu/ebj/www/ww1/Biography-Ford.html, accessed 9-25-2018). 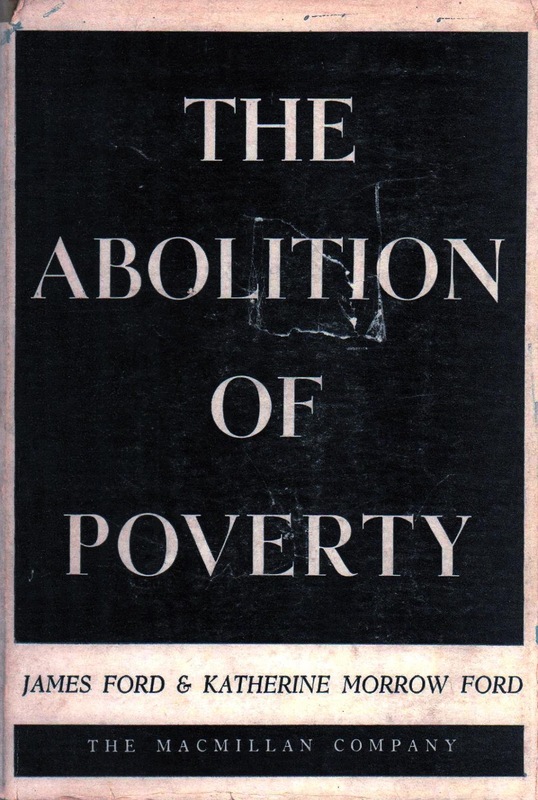 The Abolition of Poverty by James Ford and Katherine Morrow Ford, MacMillan, New York, 1937. 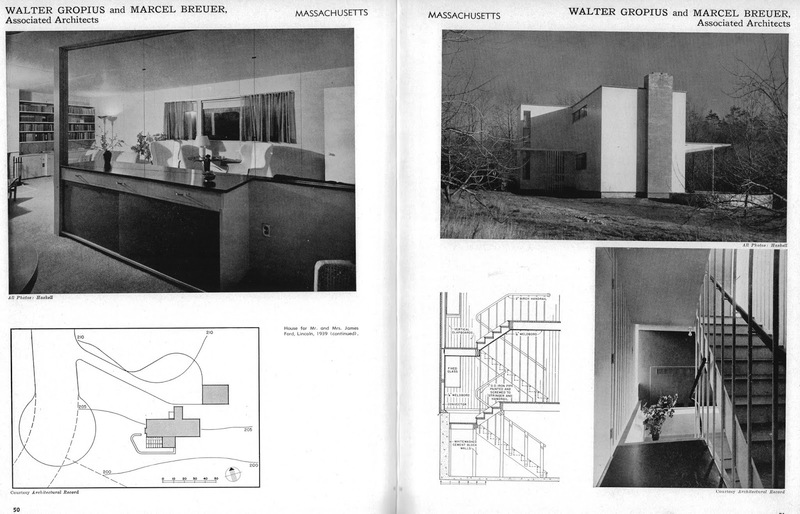 Marcel Breuer and Walter Gropius were lured to Harvard to teach by Dr. Joseph Hudnut in 1937. Gropius accepted the appointment as chairman of Harvard's Graduate School of Design and Breuer followed his mentor to eventually join the faculty with his Bauhaus mentor Gropius in Cambridge, Massachusetts. The two men formed a partnership that was to greatly influence the establishment of an American way of designing modern houses. Shortly after their arrival, Boston philanthropist Helen Storrow made it possible for four members of the Harvard faculty - Gropius, Breuer, Bogner and James Ford - to build and live in modern homes on her property on Wood's End Road near Walden Pond. Ford and his young bride Katherine Morrow Ford with whom he had recently completed Slums and Housing in 1936 and The Abolition of Poverty in 1937 (see above) leased their house from Storrow at 10 percent of cost per year with an option to buy and moved in with their prestigious neighbors into the now famous Woods End Road Colony (see above and below). Ford House, Woods End Road, Lincoln, MA, 1939. Walter Gropius and Marcel Breuer, architects. The Architecture Committee for the below MoMA publication Guide to Modern Architecture: Northeast States consisted of Philip Goodwin, Chairman; Winslow Ames, Catherine Bauer, John Coolidge, Talbot Hamlin, Joseph Hudnut, Carl Feiss, Henry-Russell Hitchcock, Jr., Edgar Kaufmann, Jr., George Nelson, Stamo Papadaki, Alfred Barr, Jr., and John McAndrew with Philip Johnson and Mrs. John Carter, Honorary Members. 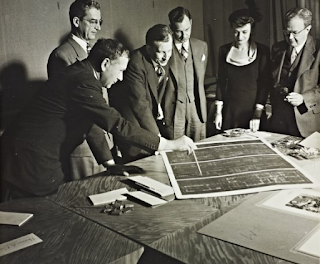 MoMA's Department of Architecture at the time consisted of John McAndrew, Curator, Janet Henrich, Assistant; Catherine Bauer's sister Elizabeth Mock, assistant; Henry Martin and Henrietta Calloway. Gropius's personal residence and that of then partner Marcel Breuer's and Walter Bogner's personal residences as well as that of the Fords all on Helen Storrow's Woods End Road estate were all included in the guide book. 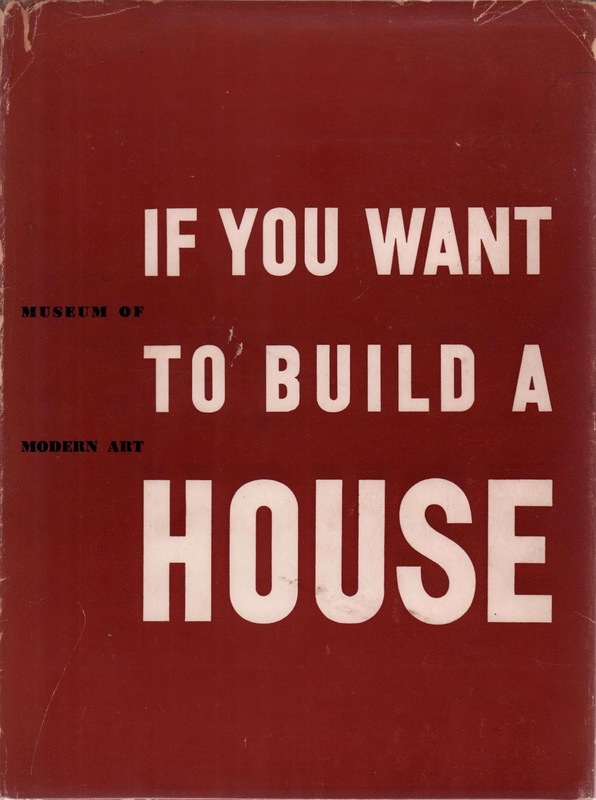 This suggests strongly that the Fords were in direct collaboration with MoMA while their book The Modern House in America and the below MoMA guide book were being planned and compiled. 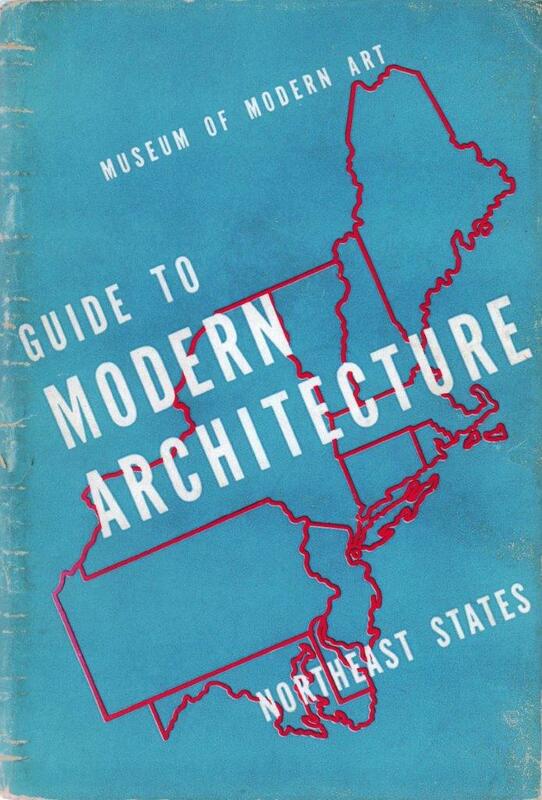 Guide to Modern Architecture: Northeast States, by Museum of Modern Art, New York, 1940. 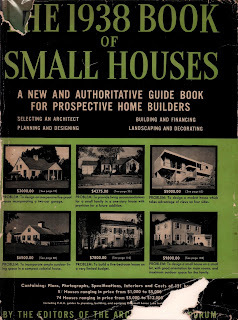 The 1938 Book of Small Houses by the editors of the Architectural Forum, New York, 1937. The Key to Your New Home by Lewis Storrs, Jr., McGraw-Hill, New York, 1938. 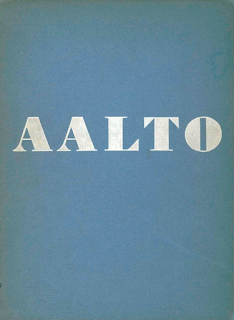 Aalto Architecture and Furniture, Museum of Modern Art, New York, March 15 - April 18, 1938. 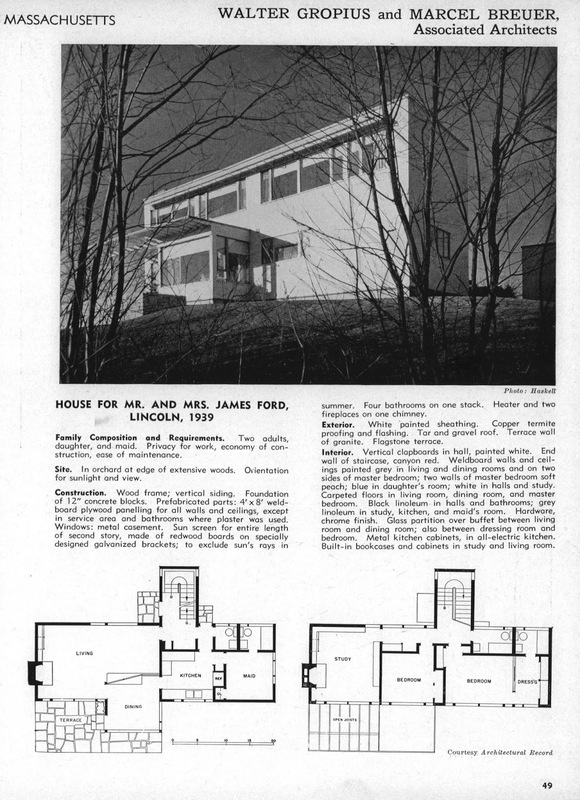 Thus the above four books (and likely others) and the arrival of Walter Gropius and Marcel Breuer on the Harvard campus and soon designing houses for themselves and the Fords on Woods End Road in Lincoln, Massachusetts inspired the the planning of the Ford's The Modern House in America featuring solely modern regional houses (see below). 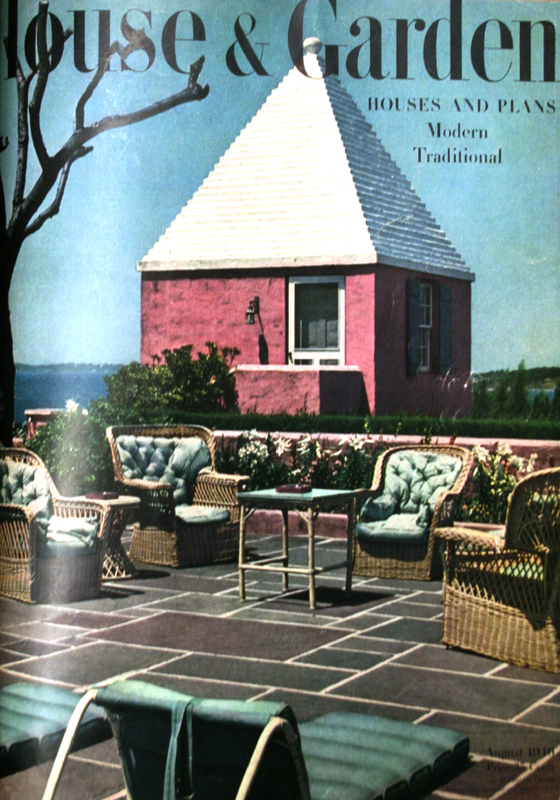 (See also Katherine Morrow Ford, “Modern Is Regional,” House and Garden (March 1941), 35-37, 79). The Fords prominently featured the houses designed by their neighbors Walter Gropius and Marcel Breuer and Walter Bogner, including their own, on Harvard philanthropist Helen Storrow's Woods End Road estate in Lincoln, Massachusetts. It was this subdivision and the collaboration of its distinguished neighbors which likely spurred the publication of this book. 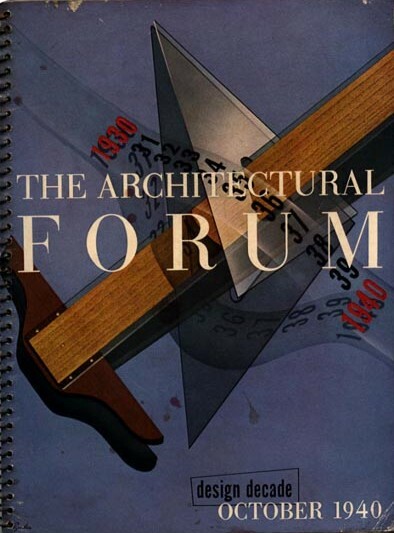 The authors were also careful to credit Architectural Record and Architectural Forum, especially singling out Forum editor Howard Myers "for encouragement and constant interest and for many courtesies extended to us throughout the period in which our data and illustrations were being assembled." 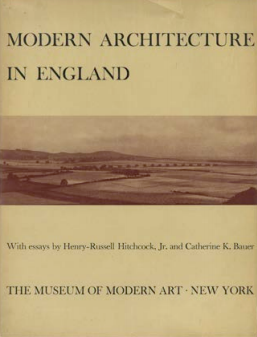 The Fords also presciently strategically acknowledged the Museum of Modern Art in New York "for their generosity in lending materials for reproduction" indicating a relationship with Mock and her seniors John McAndrews and Philip Goodwin at MoMA and likely including museum coterie members Philip Johnson and Henry-Russell Hitchcock. Ford House, Woods End Road, Lincoln, Massachusetts, 1939, Walter Gropius and Marcel Breuer, architects. Photos by Arthur Haskell. From The Modern House in America by James Ford and Katherine Morrow Ford, Architectural Book Publishing Co., New York, 1940, pp. 49-51. 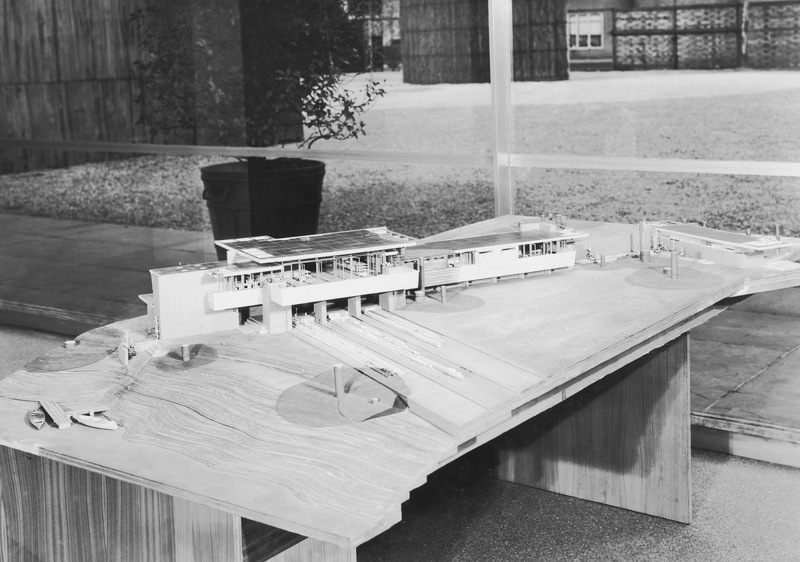 Besides focusing on the work of their Woods End Hole Road neighbors Gropius and Breuer and Walter Bogner, the Fords also included work by a contingent of Southern Californians headed by Richard Neutra and R. M. Schindler and their disciples Gregory Ain, Harwell Harris and Raphael Soriano. Indicating a close kinship with Catherine Bauer and her new husband future Harvard fellow and MIT Dean William Wurster, they also selected projects by Bay Region architects headed by Wurster and his like-minded colleagues such as Gardner Dailey, Michael Goodman, and Clarence Mayhew. 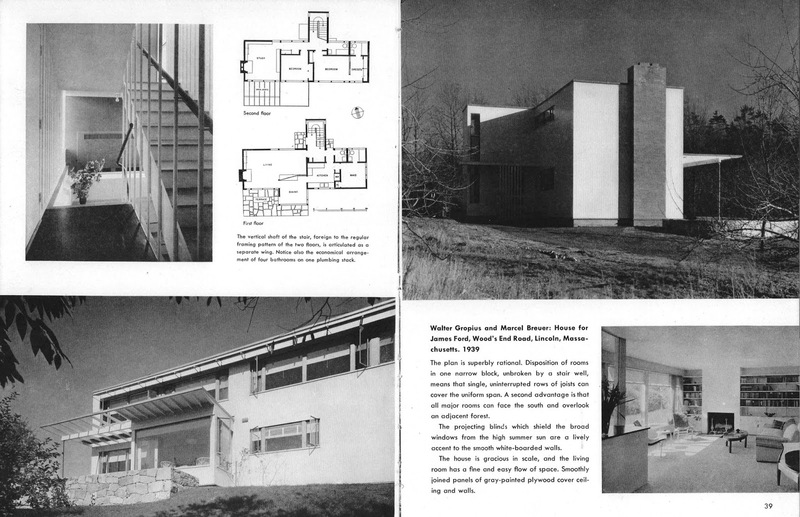 (Author's Notes: The Ford House was also published in the March 1940 issue of Architectural Record on pp. 108-111. Editors Frank G. Lopez, Jr. and George A Sanderson later worked for Katherine Morrow Ford's second husband Thomas Creighton at Progressive Architecture magazine. Editor Elizabeth Kendall later moved to Berkeley and became West Coast editor and strong supporter of the Bay Regionalist architecture of William Wurster and colleagues.). "[The Fords] book contains almost no bad houses. On the other hand, they have deliberately discharged the very best. They "decided to omit all of the work of Frank Lloyd Wright, because illustrated accounts of the latter are available in other volumes." But this is equally true of most of the material they actually published, since it either had appeared or was about to appear in the architectural periodicals." (Coolidge, John, The New England Quarterly, Vol. 15, No. 1 (Mar., 1942), pp. 188-190). 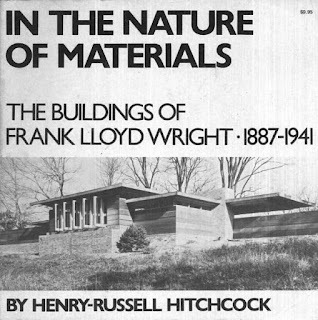 In the Ford's defense they had likely been in contact with fellow Architectural Forum contributor (with George Nelson) Douglas Haskell who had recently visited and written about Wright, and Henry-Russell Hitchcock who was planning a major retrospective on Wright's career at MoMA (see below for example). 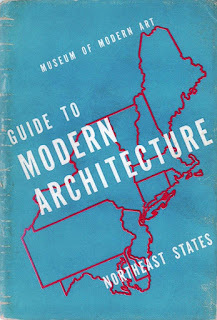 Furthermore, Wright's Northeastern work was mentioned in Philip Goodwin's introduction as well as being featured in MoMA's 1940 guide book referenced earlier above. 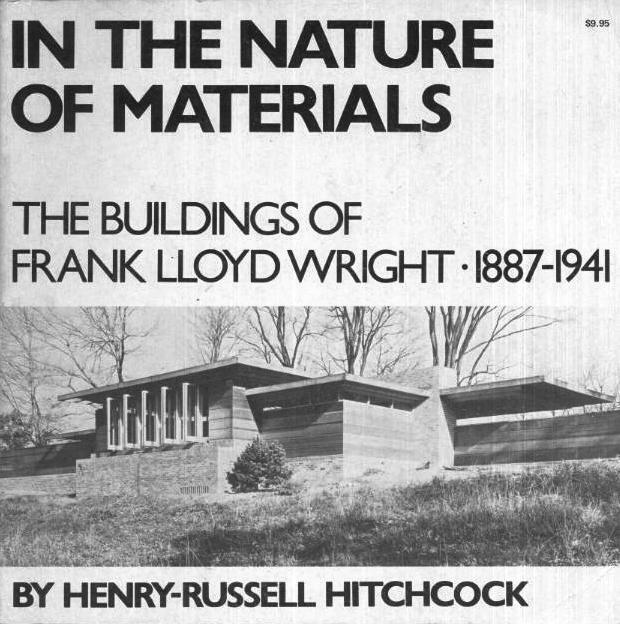 Henry-Russell Hitchcock finally realized that no book on the subject of modern houses would be complete without including the work of Frank Lloyd Wright. He took it upon himself to organize an exhibition of the master's work after Wright's Kaufmann tour de force garnered so much favorable publicity including a one-house show at MoMA in 1938 shortly before Mock beginning work at the museum. Mock must have been impressed and eagerly supportive of Hitchcock's exhibition which subsequently resulted in the book In the Nature of Materials (see below). In the Nature of Materials by Henry-Russell Hitchcock, Duell, Sloan and Pearce, New York, 1941. 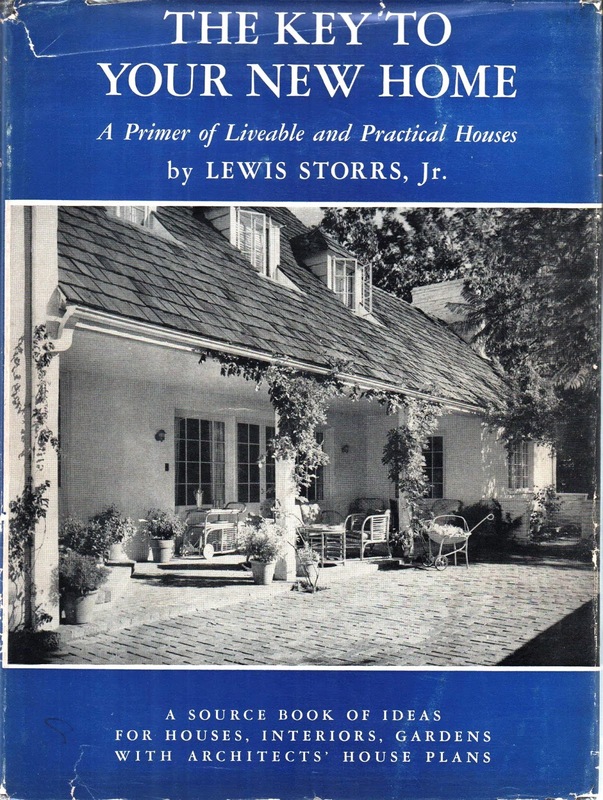 Hitchcock's book was published around the same time as Katherine Morrow Ford's "Guide to Regional Characteristics" was published in House & Garden clearly signalling her and husband James's alignment with Regionalist philosophy supported by Wurster, Bauer, Mock and their Bay Region colleagues. (Ford, Katherine Morrow, "Modern is Regional," House & Garden, March 1941, pp. 35-37, 79). Ford, Katherine Morrow, "Modern is Regional," House & Garden, March 1941, pp. 35-37, 79. 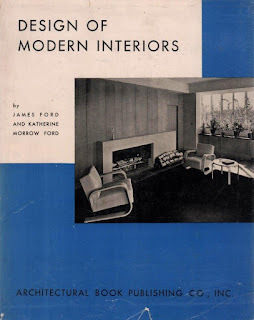 Katherine Morrow Ford previewed her modernist relationship with House & Garden magazine in March of 1941 with her very prescient article "Modern is Regional" (see above) using the Ford's own Gropius-Breuer-designed home as one of the article illustrations. 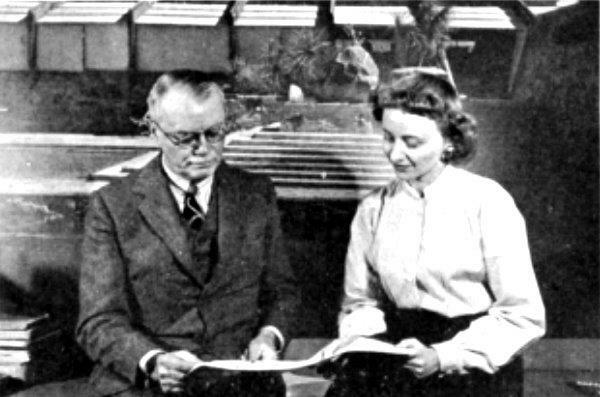 She ended up consulting with the magazine periodically appearing on the masthead as architectural editor between her husband's passing and 1951 when she quit the magazine over philosophical differences as discussed later below. 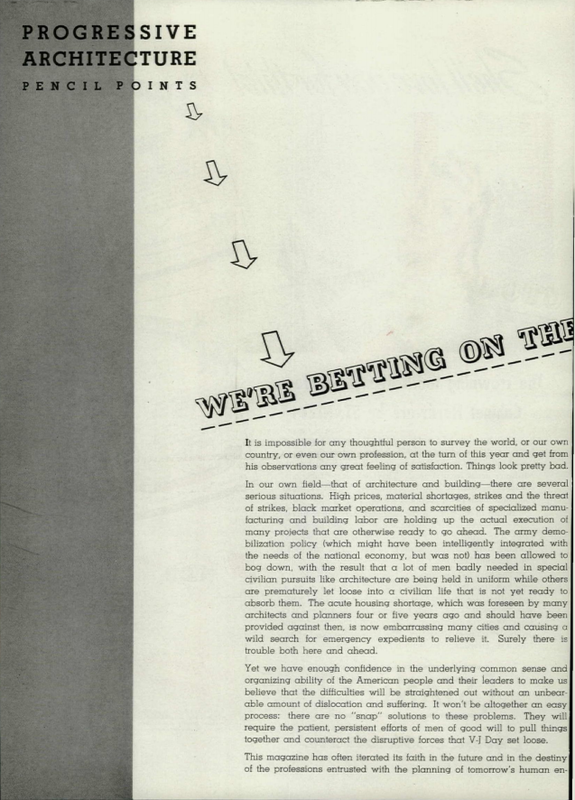 Presaging the debates precipitated by the February 1948 MoMA symposium "What is Happening to Modern Architecture? 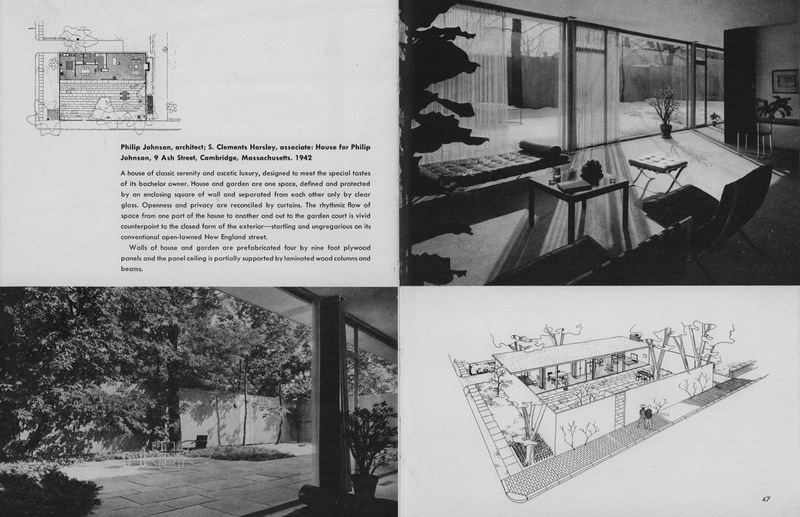 "organized by a International Style apologist Philip Johnson in response to Lewis Mumford's New Yorker article espousing the "Bay Region Style" as an entirely acceptable and successful form of Regionalism, Katherine Morrow Ford had already subconsciously joined forces with Mumford, Wurster, Bauer, Mock and her future co-author and husband Thomas Creighton with her 1941 House & Garden article "Modern is Regional." (Ford, Katherine Morrow, "Modern is Regional," House & Garden, March 1941. pp. 35-37, 79). Undoubtedly inspired by the Ford's book, George Nelson embarked upon a series "When You Build Your Own House" for Arts & Decoration magazine that same year. Nelson also continued consulting with Architectural Forum and was responsible for the important October 1940 "Design Decade" issue below which period correspondence indicates that he almost certainly collaborated with the Fords, MoMA, Grace Morley of the San Francisco Museum of Art, and others upon. Design Decade, edited by George Nelson, Architectural Forum, October 1940. Selection jury for MoMA's Organic Design exhibition. 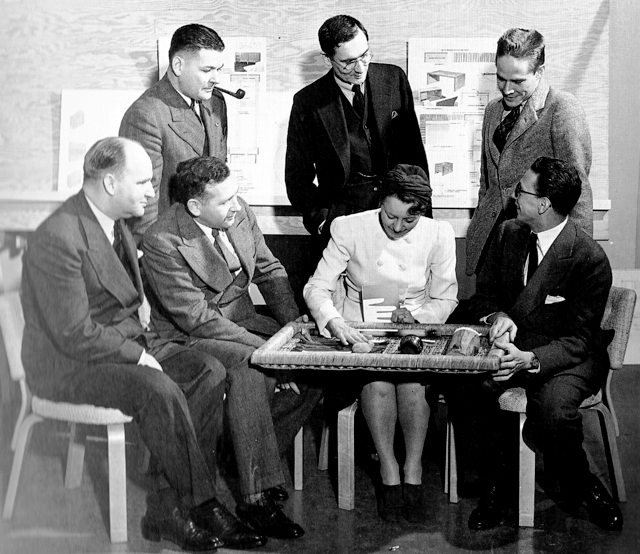 Seated from left: Edward D. Stone, Marcel Breuer, Catherine Bauer, Edgar Kaufmann, Jr. Standing from left: ?, Alfred Barr, Jr., Eliot Noyes. Photographer unknown, ca.1940. 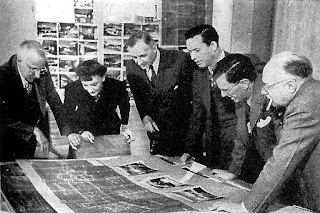 Eliot Noyes was a Harvard student and later on the Gropius and Breuer architectural design staff before joining MoMA's industrial design staff in 1939 (standing far right above). Edgar Kaufmann, Jr. proposed the "Organic Design" (see below) competition to Alfred Barr in 1940 and served on the exhibition selection jury with Barr, Eliot Noyes, Edward Durrell Stone, Marcel Breuer, Catherine Bauer and George Nelson (see above). Kaufmann joined MoMA's industrial design curatorial staff after the war and headed up their "Good Design" exhibitions in the early 1950s. 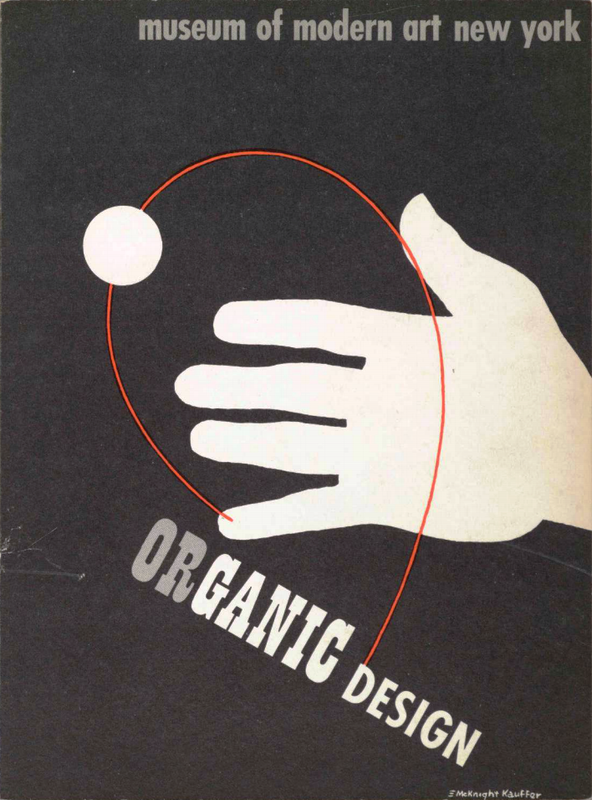 Organic Design by Eliot Noyes, Museum of Modern Art, New York, September 24 - November 9, 1941. Emboldened by the success of their first book on the modern house, the Fords immediately embarked upon their second publishing venture for the Architectural Book Publishing Company. 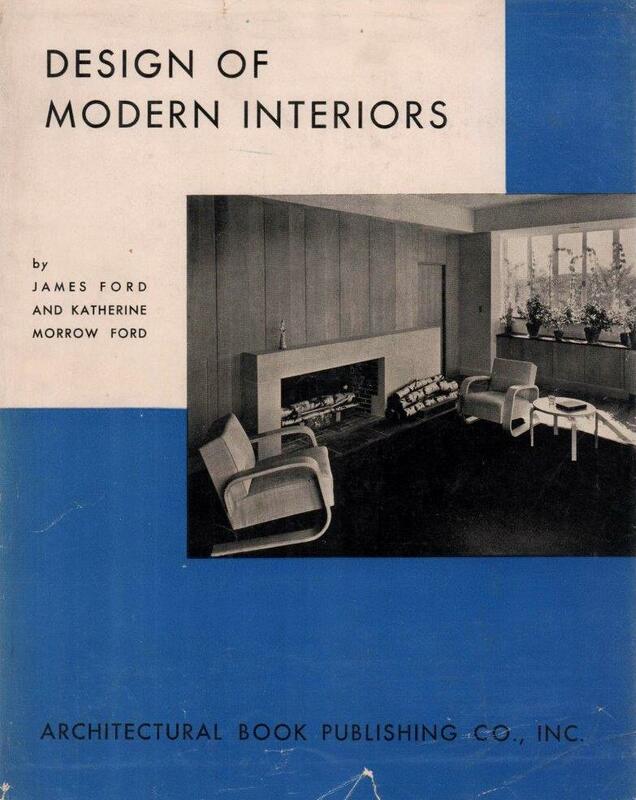 Inspired by the success of, and using many photos from, MoMAS's recent "Organic Design" exhibition and using many of the leftover photos from their first book, the Fords published the Design of Modern Interiors in 1942 (see below). "The original purpose of this book was to present, by means of illustrations, the contemporary phases of a significant culture movement, and to provide a companion volume for The Modern House in America amplifying the design of interior arrangements and furnishing." The Fords again published the interiors of their Woods End Road neighbors Gropius and Breuer and Walter Bogner and many of the same architects and designers included in their first book. They had the benefit of first hand collaboration with MoMA "Organic Design" and architecture curatorial staff and furniture designer Marcel Breuer and the emergence of Alvar Aalto's furniture for Artek at a 1938 MoMA Aalto exhibition referenced earlier above. (Author's note: Elizabeth Mock undoubtedly collaborated on this book as well). Ad for Tomorrow's House, House & Garden, April 1946. 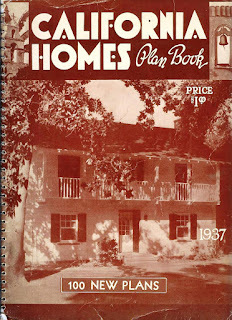 Clearly demonstrating the wartime popularity and pent up demand for information regarding the modern regional house, the Ford's The Modern House in America went through six printings between its initial release in 1940 and 1946 around when Architectural Forum's then editorial contributors George Nelson and Henry Wight released their 1945 effort Tomorrow's House, which itself went through four printings by 1946, rising as high as number nine on the New York Times best-seller list. 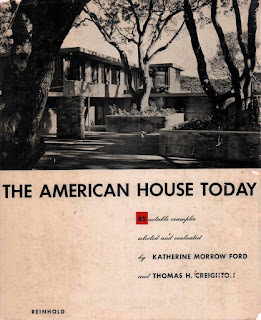 About the time Katherine Morrow Ford joined the staff of House & Garden as architectural editor, the magazine ran the above ad for George Nelson and Henry Wight's guide to the modern house. Katherine by that time had separated herself from the Woods End Road community after her husband James passed away in the spring of 1945 and moved to New York, first house-sitting for the summer at mutual friend within Wright and Wurster's circle, architectural writer and editor Douglas Haskell's family apartment. 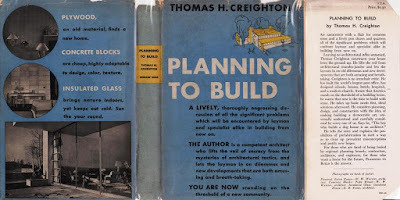 Planning to Build by Thomas H. Creighton, Doubleday, Doran, New York, March 1945. 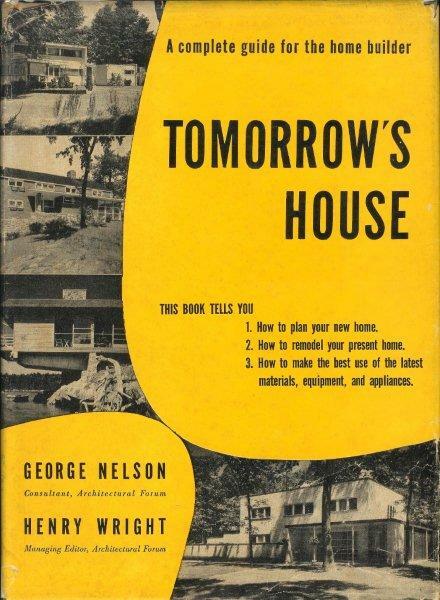 About this time Morrow Ford likely began crossing paths with future husband and house book collaborator Thomas Creighton who was busy on his career-making Progressive Architecture feature article "Pearl Harbor to Nagasaki" which was a comprehensive compilation of war time architecture. The article, perhaps commissioned based on the strength of his book Planning to Build (see above) resulted in him being offered the editorship of the magazine the following month. 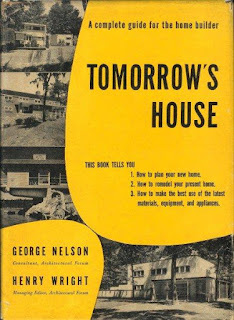 (Author's Note: Creighton had already befriended newly named MIT Dean of Architecture William Wurster evidenced by his using Wurster's Eaton and Pope Houses to illustrate the back cover of his 1945 book Planning to Build.). Creighton included projects by William W. Wurster and John Funk's Heckendorf House in Modesto in his lengthy post-war article of recent architecture appearing among his 40-page spread in January's issue of P/A. Thus, it is easy to imagine that Harvard graduate Creighton at least compared notes with newly named MIT architecture Dean Wurster (and Bauer and Mock) while working on the article. Seemingly more than a coincidence, Wurster's wife Catherine Bauer's sister, Elizabeth Mock, also selected the Heckendorf House for the cover of her now iconic 1944 MoMA exhibition "Built In USA, 1932-1944" (see later below). This suggests architectural philosophical alignment between Wurster, Bauer, Mock and Creighton, not to mention P/A's then editor Kenneth Reid, which will be discussed in more detail later. 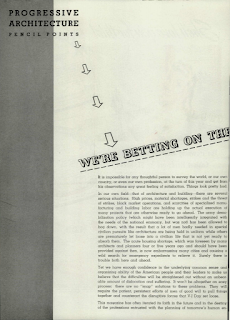 Reid, Kenneth, "We're Betting on the Future," Progressive Architecture, February 1946, pp. 42-43. "We announce with pleasure and pride the addition to our already energetic and able editorial staff of a new member who brings us fresh strength, enthusiasm, and mature understanding of the practical problems of the architectural world. 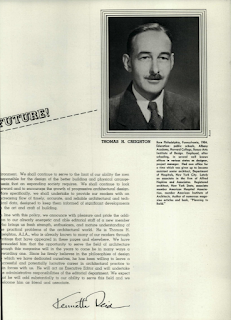 He is Thomas H. Creighton, A.I.A., who is already known to many of our readers through writings that have appeared in these pages and elsewhere. We have persuaded him that the opportunity to serve the field of architecture trough this magazine will in the years to come be in many ways a rewarding one. Since he firmly believes in the philosophies of design which we have dedicated ourselves, he has been willing to leave a successful and potentially lucrative career in architectural practice to in forces with us. He will act as Executive Editor and will undertake the administrative responsibilities of the editorial department. We expect that he will add substantially to our ability to serve this field and we welcome him as friend and associate." (Ibid). Philip Goodwin and Elizabeth Mock planning MoMA's Built in USA: 1932-1944. Frank Lloyd Wright's Taliesin West in background. Mock, Elizabeth, Built In USA, 1932-1944, Museum of Modern Art, New York, 1944. 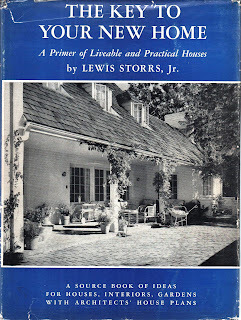 Cover: Heckendorf House, Modesto, 1939. John Funk, architect. Elizabeth Mock likely bonded with Katherine Morrow Ford and her husband James during her time at the Museum of Modern Art between 1938 and James's passing in 1945 and Mock's Johnson-induced ouster at MoMA in 1946. 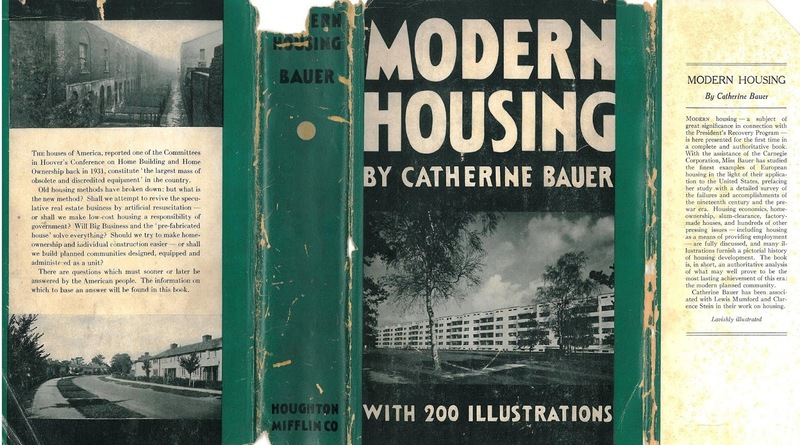 Mock also perhaps befriended Ford and also bonded with Marcel Breuer and Walter Gropius around the same time through her sister Catherine Bauer after she accompanied her husband William Wurster on a doctoral fellowship to study City Planning at Harvard in the summer of 1943. 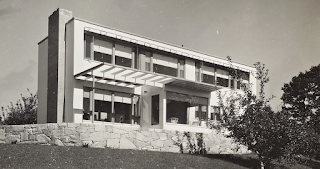 She undoubtedly visited on numerous occasions the four house compound of the Fords, Gropius, Breuer and Bogner on Woods End Road in Lincoln, Massachusetts while visiting her sister and by then MIT Dean of Architecture Wurster in nearby Cambridge. Thus it was very easy to include the Ford's 1939 Gropius-Breuer-designed house in her 1944 exhibition and catalogue Built in USA: 1932-1944 (see above and below). (Author's Note: James Ford passed away in the spring of 1945 and Katherine left their Gropius and Breuer-designed house, moved to New York and began work as architectural consultant and editor at House & Garden Magazine.). 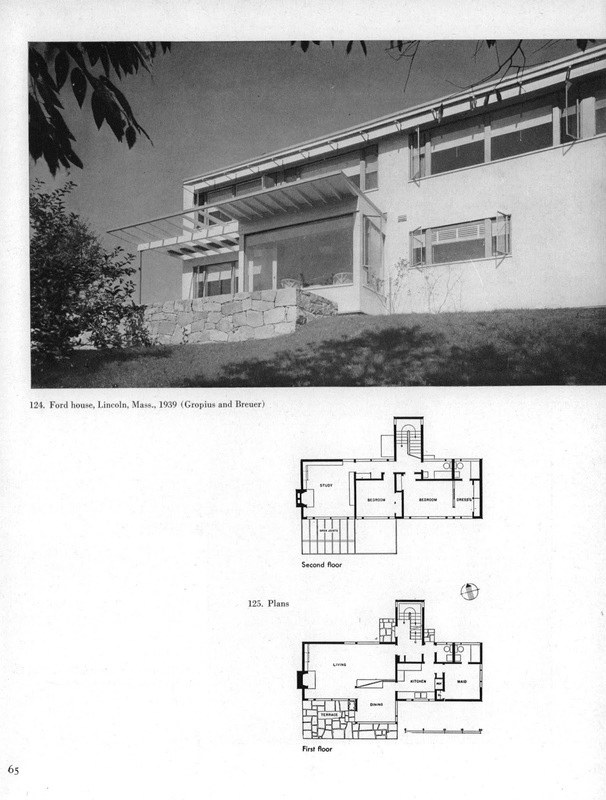 Walter Gropius and Marcel Breuer: House for James Ford, Wood's End Road, Lincoln, Massachusetts. 1939. Mock, Elizabeth, Built In USA, 1932-1944, Museum of Modern Art, New York, 1944, pp. 38-39. Philip Johnson, architect; S. Clements Horsley, associate, House for Philip Johnson, 9 Ash Street, Cambridge, Massachusetts. 1942. Mock, Elizabeth, Built In USA, 1932-1944, Museum of Modern Art, New York, 1944, pp. 46-47. Politically, Mock shrewdly included MoMA architectural department founder Philip Johnson's 1942 Mies van der Rohe-inspired Cambridge House designed under the tutelage of Gropius and Breuer while the very wealthy Johnson was a Harvard architecture student (see below). (Author's Note: Johnson preceded Mock at MoMA and ousted her when he came back in 1946. Johnson was opposed philosophically with Mock's regionalist direction as he was still a firm believer in the International Style espoused in his, Henry-Russell Hitchcock and Alfred Barr's now legendary 1932 MoMA show "Modern Architecture: International Exhibition."). 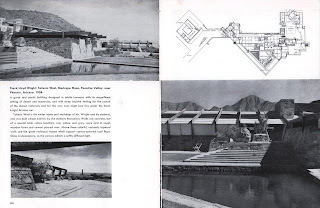 Frank Lloyd Wright: Taliesin West, Maricopa Mesa, Paradise Valley, near Phoenix, Arizona. 1938. Mock, Elizabeth, Built In USA, 1932-1944, Museum of Modern Art, New York, 1944, pp. 84-85. Mock also included in the show much work by her Taliesin apprenticeship mentor Frank Lloyd Wright. Mock was in the inaugural Fellowship class of 1932 which is where she met and married her first husband Rudolf Mock. 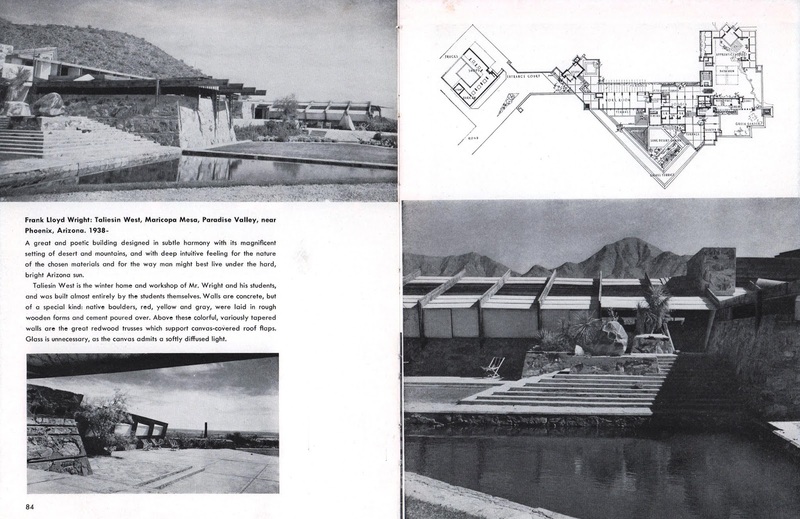 She presciently included Wright's Taliesin West in Built in USA as she later spent the winters of 1948 and 1949 there finishing her final MoMA-related exhibition The Architecture of Bridges in which she also included bridges designed by Wright and Taliesin Fellow Paolo Soleri and her soon-to-be second husband Kenneth Kassler. 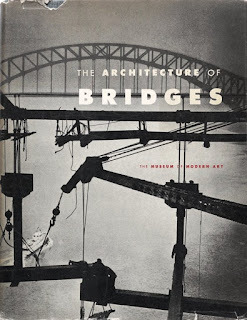 The Architecture of Bridges by Elizabeth Mock, Museum of Modern Art, New York, 1949. 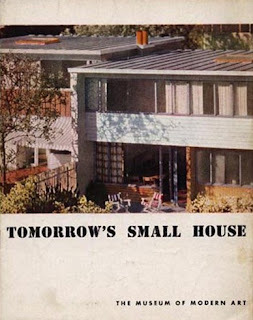 Tomorrow's Small House by Elizabeth Mock, Museum of Modern Art, New York, May 29-September 30, 1945. Elizabeth Mock and Katherine Morrow Ford most likely met at one of Mock's exhibition openings at MoMA especially after her sister and husband moved to Cambridge in the summer of 1943. They must have met through socializing with Marcel Breuer and/or Walter Gropius at their Woods End Road houses near the Ford House which he and Gropius also designed. They almost certainly would have attended industry events together, certainly after James Ford passed away in 1944 resulting in Katherine's move to New York and employment as House & Garden magazine's architectural editor beginning in 1946, the same year Mock was ousted by Philip Johnson at MoMA. Katherine Morrow Ford house sat for the Douglas Haskells during the summer of 1945 for example. At about the same time Mock was working on her 1945 and 1946 exhibitions and catalogues accordingly. Thus the two women were likely collaborating in some fashion such as sharing publication photos. (see above and below). 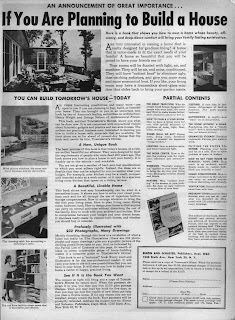 (Author's note: Ford paid Mock back somewhat for her earlier collaboration by publishing her article "Modern House" in the August 1946 issue of House & Garden after becoming architectural editor (see below). House & Garden, August, 1946. 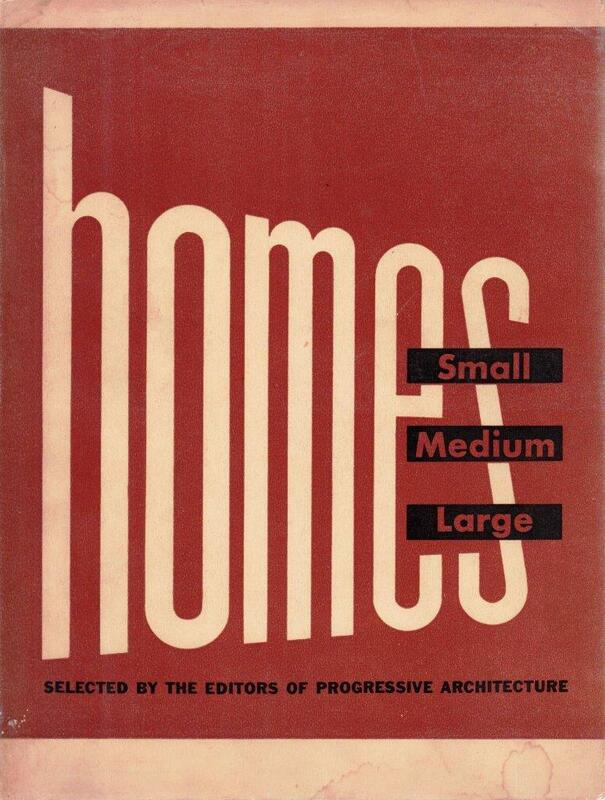 Issue contains "Modern House" by Elizabeth B. Mock. 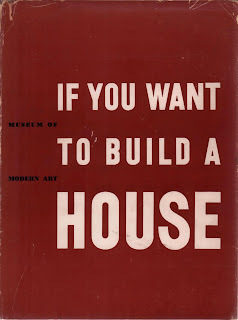 If You Want to Build a House by Elizabeth Mock, Museum of Modern Art, New York, January 8-30, 1946. The Architecture Committee for the above show, just before Mock left to join husband Rudi at the Tennessee Valley Authority, consisted of Chairman Philip Goodwin, Winslow Ames, Alfred H. Barr, Jr., her sister Catherine Bauer, Ernestine Fantl, John Coolidge, Carl Feiss, Tabot Hamlin, Henry-Russell Hitchcock, Joseph Hudnut, Philip Johnson, also former Taliesin Fellow Edgar Kaufmann, Jr., John McAndrew, George Nelson, and Stamo Papadaki. 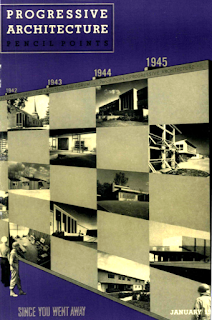 In this show and catalogue Mock featured many projects of her and her sister's idol Frank Lloyd Wright, and that of her brother-in-law William Wurster and his Bay Region circle including Gardner Dailey, Francis J. McCarthy, John Dinwiddie, Henry Hill, Mario Corbett, Clarence Mayhew, John Funk (including his Heckendorf House which previously graced the cover of Mock's 1944 Built in USA), as well as much Wright-inspired work by Harwell Harris, and much work by her sister's Harvard colleagues Breuer and Gropius including the James and Katherine Morrow Ford House. She also included her husband Rudolf Mock, and even furnishings by John Cage's wife Xenia Cage. (Author's note: For much on the relationship of John and Xenia Cage see my "Schindlers-Westons-Kashevaroff-Cage and Their Avant-Garde Relationships".). 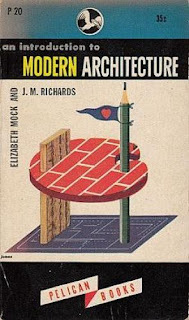 An Introduction to Modern Architecture by J. M. Richards and Elizabeth B. Mock, Penguin Books, New York, 1947, front cover. 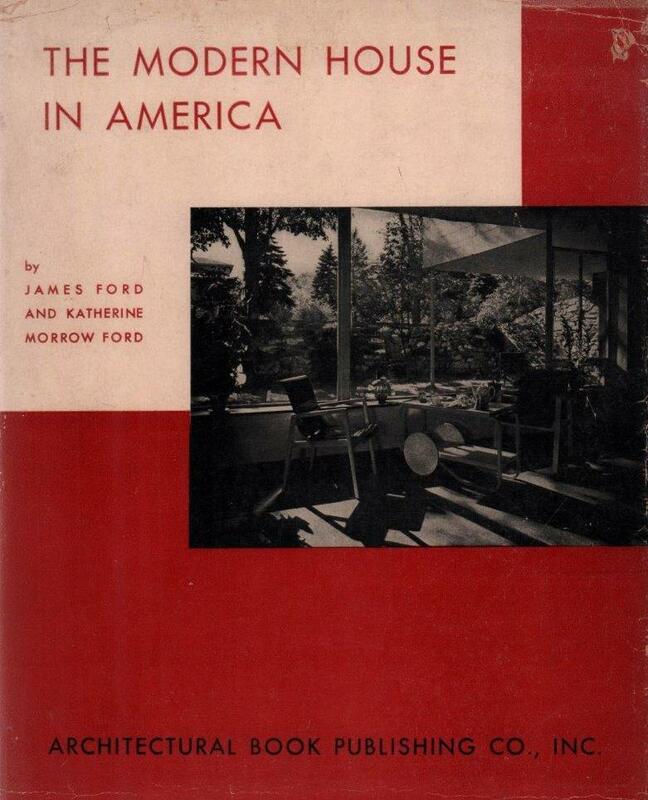 Further evidence of a close connection between Elizabeth Mock and Katherine Morrow Ford is provided by the fact that Mock included Ford's Lincoln, MA house designed by Gropius and Breuer amongst her American contributions culled from her 1944 MoMA exhibition Built in USA: 1932-1944 to the 1947 revised edition of James Richards's An Introduction to Modern Architecture. 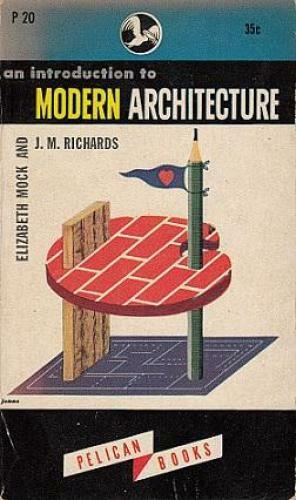 Richards's book was originally published in 1940 using only European projects, and was likely inspired by the 1937 MoMA publication Modern Architecture in England by Mock's sister Catherine Bauer and Henry-Russel Hitchcock. Seemingly more than a coincidence, the Hitchcock-Bauer book was profusely illustrated with photographs from the pages of Richards's Architectural Review. Catalogue for Mies van der Rohe, Museum of Modern Art, New York, September 16, 1947 - January 25, 1948. "Philip Johnson's personal war against un-straightforward architecture is seen in his own houses, his early introduction to Mies van der Rohe to this country. Consultant on architecture at the Museum of Modern Art, he is responsible for its Mies show and its catalogue." 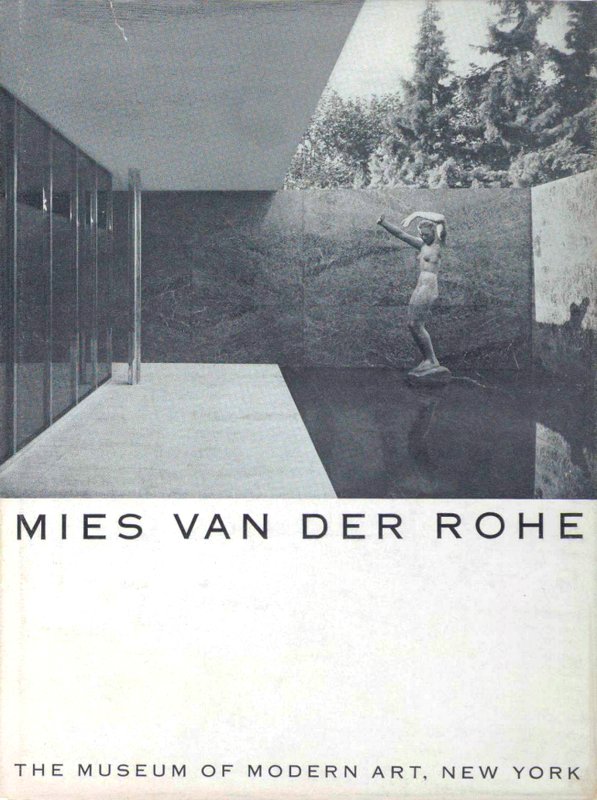 (Johnson, Philip, "Mies van der Rohe," House & Garden, November 1947, pp. 190-191, 245-246). Shortly after returning to the MoMA in 1946 Philip Johnson ousted Mock and hired young Peter Blake and soon began planning exhibitions featuring idols Mies van der Rohe and Marcel Breuer. (Author's Note: Johnson's other Bauhaus International Style idol Walter Gropius had already been featured by MoMA in 1938 along with Alvar Aalto in a separate exhibition). (For much more on this see my and Jose Parra's upcoming chapter "Lewis Mumford, Henry-Russell Hitchcock and the Rise of Bay Regionalism"). 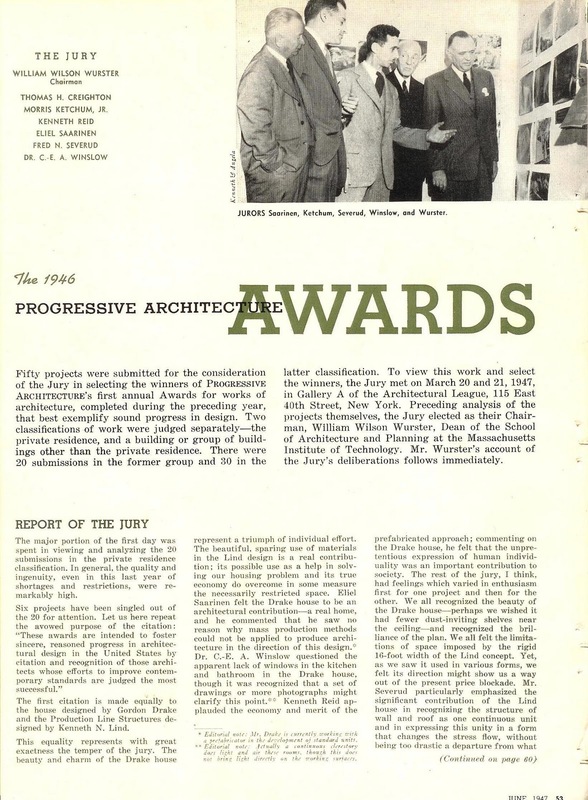 "The 1946 Progressive Architecture Awards," Progressive Architecture, June, 1947, p. 53. Creighton wasted no time in establishing his footprint at P/A. He quickly embarked upon an awards program and used his substantial connections and position in the architectural community to name his first Progressive Architecture Awards jury chaired by none other than his by close friend William Wurster who was by the Dean of MIT's Architecture and Planning Department (see above). 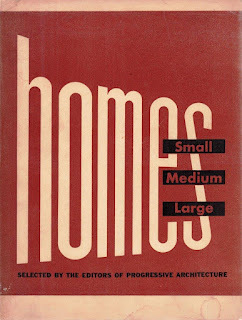 About the time Creighton was getting settled into his new editorial position at Progressive Architecture he also immediately began planning a book Homes: Small, Medium, Large (see above) as selected by his editorial staff, Charles Magruder and previous Architectural Record editorial staff Frank Lopez, and George Sanderson mentioned earlier above. The work of William Wurster (5 houses) and his Bay Region colleagues Francis McCarthy, John Ekin Dinwiddie, Joseph Hill Joseph Esherick, John Campbell and Worley Wong, Albert Henry Hill, Phillip Joseph, Clarence Mayhew, William Hempel, Serge Chermayeff and others were prominently featured. 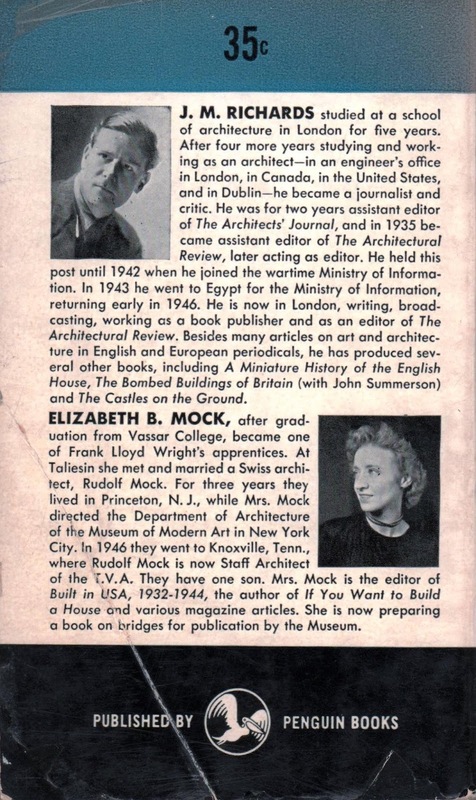 Coincidentally Elizabeth Mock was likely involved in the book's planning as her first husband Rudolf Mock, and second husband, Kenneth Kassler ere also represented. 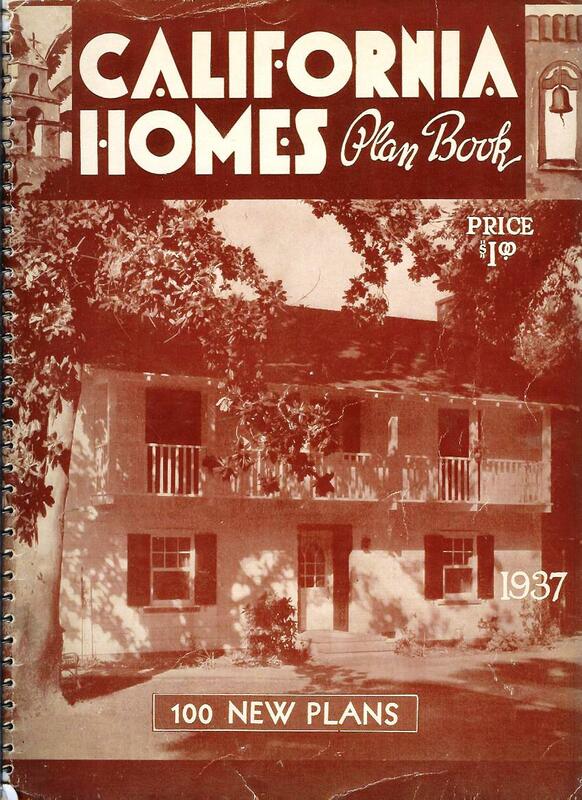 The book consisted of 100 floor plans and diagrams of designs for 90 contemporary homes, organized in three sections: one-bedroom homes; two-bedroom homes; and homes with three or more bedrooms. Architects, besides those already mentioned, included were: George Fred and William Keck, Pietro Belluschi, Richard Neutra (2 houses), Edward Durell Stone, Hugh Stubbins, Richard Aeck, Gregory Ain, Van Evera Bailey, Thomas Baird, Walter Behrendt, Paul Beidler, Robert Bishop, Arthur Brown, Robert Brown, Elizabeth/Winston Close, Jack Coble, J. R. Davidson, Kenneth Day, Gordon Drake, Malcolm Duncan, James Eppenstein, David Fried, Vincent Furno, William Fyfe, Austin Hall, Bernard Harrison, Ralph Haver, Gannet Herwig, Victorine/Samuel Homsey, Victor Hornbein, Burnham Hoyt, Huson Jackson, Edwin Johnson, William Kaeser, Paul Kirk, Charles Lorenz, MacKie and Kamrath, George Nemeny, Ralph Peterson, Buford Pickens, Vincent Rainey, Antonin Raymond, Joseph Richardson, Schweikher and Elting, Millard Sheets, Albert Simonson, Whitney Smith, John Spaeth, Carlton Steiner, Paul Thiry, John Yeon, and L. Morgan Yost. Katherine Morrow Ford and selection jury for House & Garden's annual house design competition. "Announcing the Prize-Winning Houses," House & Garden, April 1948, p. 171. While this was going on Katherine Morrow Ford was kindredly doing the same thing at House & Garden magazine (see above for example). As House & Garden architectural consultant and contributing editor Ford was most likely in the loop and in tune with the activities of Thomas Creighton and certainly subscribed or had access to Progressive Architecture. Princeton Bicentennial Celebration and Symposium Attendees, late spring 1947. Also shortly after Creighton started at P/A, Princeton University was celebrating its bicentennial. Many luminaries in the architectural field besides himself, such as, Frank Lloyd Wright, Alvar Aalto, William Wurster (and likely his wife Catherine Bauer and sister-in-law Elizabeth Mock who both grew up and still had connections in Princeton), Walter Gropius, Joseph Hudnut, A. Lawrence Kocher, Serge Chermayeff, Richard Neutra, Siegfried Giedion, George Howe, Elizabeth Mock's second husband and fellow Princeton, NJ hometowner Kenneth Kassler and many others. Creighton anthologized the attendees' lectures into a coherent set of proceedings which he published in 194 under the title Building for Modern Man (see above and below). 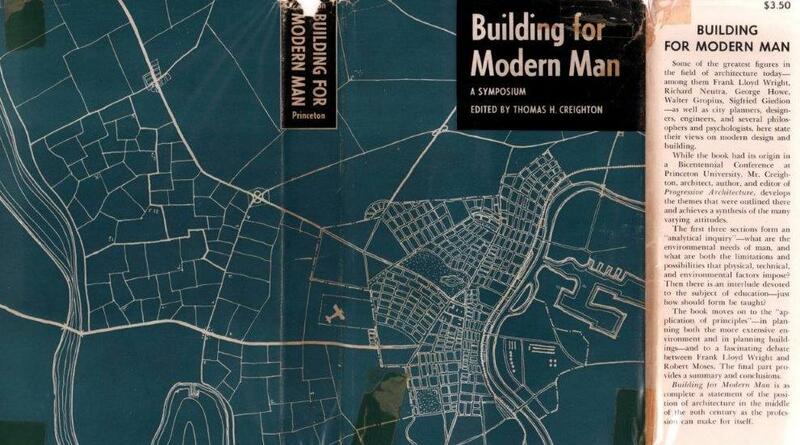 Creighton, Thomas, Building for Modern Man, Princeton University Press, 1949. "The main battle lines had apparently been drawn following the 1948 "What is Happening to Modern Architecture?" symposium and the dispute between enthusiasts and opponents of Mumford’s arguments played themselves out on the pages of the most reputed architectural journals of the country. 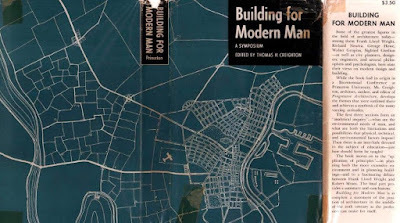 For instance, in the April 1948 issue of Progressive Architecture Thomas Creighton published an editorial under the form of a letter to Philip Johnson expressing his support of Lewis Mumford’s regionalist viewpoint. Correspondingly, in December, 1948, Creighton published a highly Wurster-sympathetic essay entitled “Architecture: Not Style” which resulted in incendiary responses speaking volumes about how aggressively and differently the interpretations of Mumford’s hot topic were received by Johnson and his MoMA cohort." (Parra-Martinex, Jose and John Crosse, "Lewis Mumford, Henry-Russell Hitchcock and the Rise of "Bay Regionalism," unpublished mss., 2018). Marcel Breuer by Peter Blake, Museum of Modern Art, New York, 1949. Ford House, Woods End Road, Lincoln, MA, 1939, Walter Gropius and Marcel Breuer, architects. 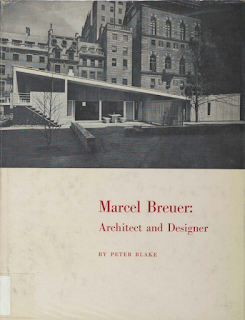 Marcel Breuer by Peter Blake, Museum of Modern Art, New York, 1949, p. 65. "...must bring into the magazine "traditional" houses rather than "modern" houses - or else. This is tantamount to telling me that I can no longer do the constructive job that I have been doing for six years, and that House & Garden is no longer interested in what is happening in the design of houses for today's kind of living in the United States..."
Seeking validation Ford sent a carbon copy of her missive to former neighbor and her personal residence designer Marcel Breuer with the handwritten note "Am going on a trip until Oct- will see you when I return. Katherine" (Ford, Katherine Morrow, typed letter signed, to Albert Kornfeld, cc to Marcel Breuer, August 30, 1951. 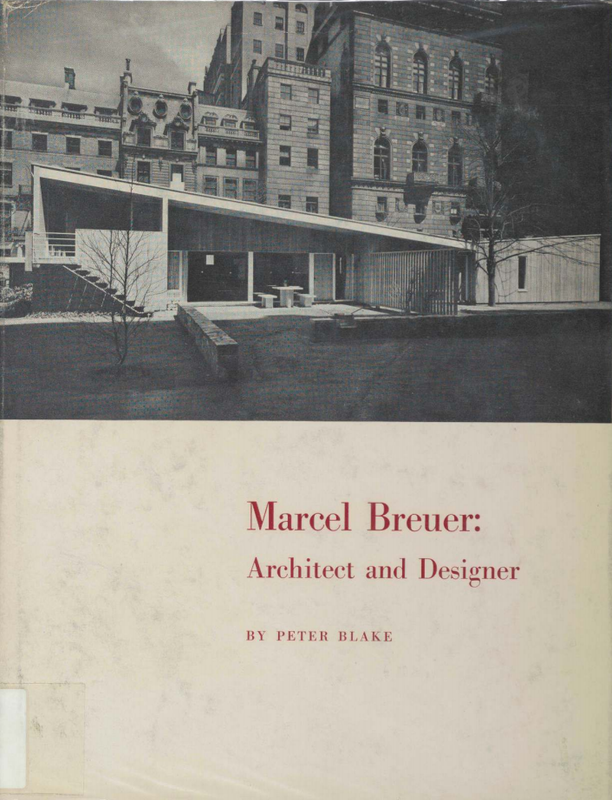 Breuer Digital Archive, Syracuse University). 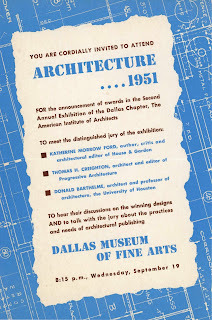 Ford was in fact leaving with future husband and co-author Thomas Creighton to appear on the selection jury for the Dallas chapter of the AIA's annual exhibition at the Dallas Museum of Fine Arts (see below). 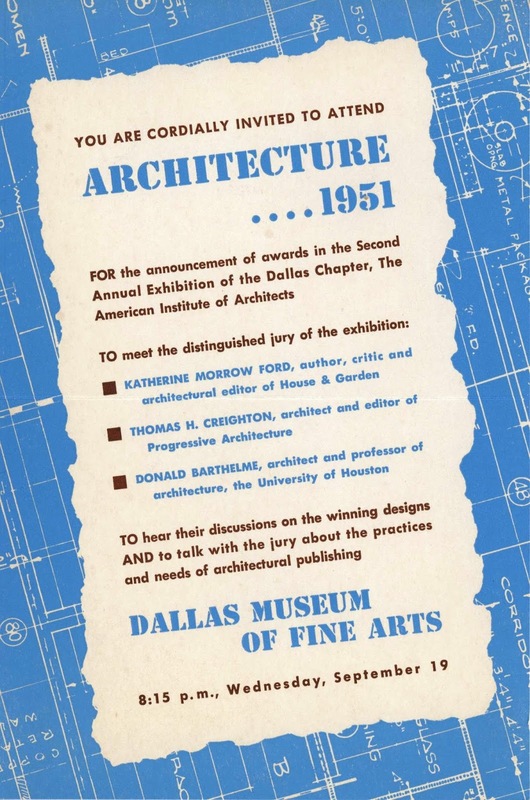 Announcement for opening of the Dallas Chapter of the AIA's annual exhibition, Dallas Museum of Fine Art, September 19, 1951. 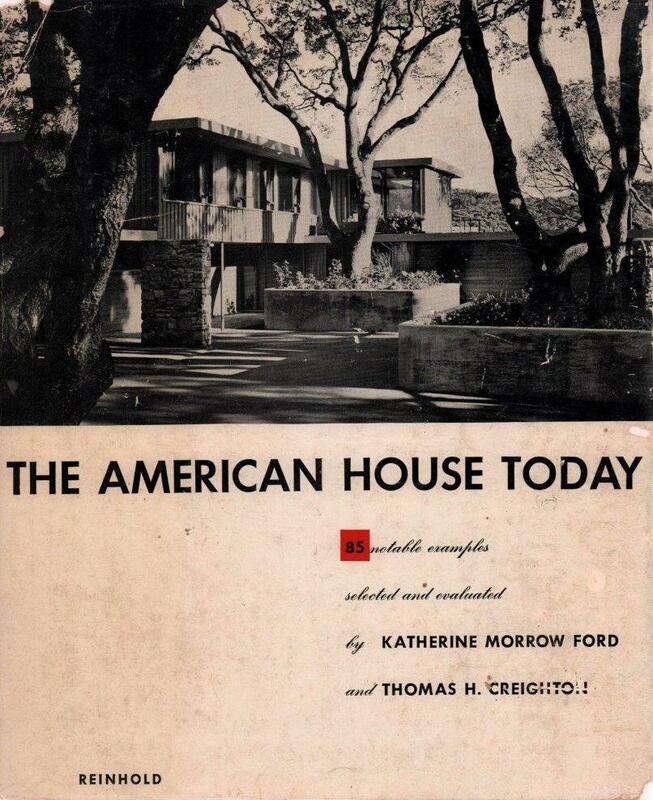 The American House Today by Katherine Morrow Ford and Thomas Creighton, Reinhold, New York, December 1951. Cover: Cosmas House, Kentfield, CA, Henry Hill, architect. Ford and Creighton's first collaboration The American House Today was published just a few months later in December of 1951 indicating that the couple had been comparing notes on Morrow Ford's frustrations at House & Garden as well as on the new book. (Katherine Morrow Ford and Thomas Creighton to Marcel Breuer, typed letter signed, October 7, 1950, Marcel Breuer Digital Archives, Syracuse University). 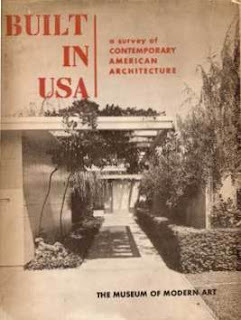 Bay Region architects included in the book among Wurster's coterie include besides himself: Mario Corbett, John Funk, Francis J. McCarthy, Henry Hill (cover house), Joseph Esherick, Fred Langhorst, and Clarence Mayhew. Others connected to Wurster and sister-in-law Elizabeth Mock include her second husband Kenneth Kassler, Philip Johnson, Harwell Harris, and Woods End Road neighbors with James and Katherine Morrow Ford, Marcel Breuer and Walter Bogner. This indicates that despite Wurster and Bauer's return to Berkeley in 1950 that Ford and Creighton continued to value the importance of their friendship and their connections with the West Coast architectural community. Living Spaces by George Nelson, Interiors Library, Whitney, New York, 1952. 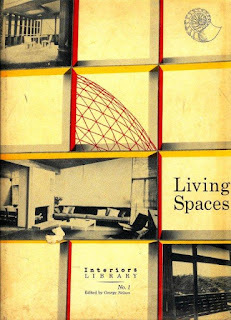 Indicating that he had been closely following the activities of Ford and Creighton, Interiors magazine editorial contributor George Nelson followed with another similar publication, Living Spaces, the following year (see above). In close collaboration with the editorial staff of Interiors magazine, the book's 232 illustrations were selected with close contact to architects and designers of international reputation. 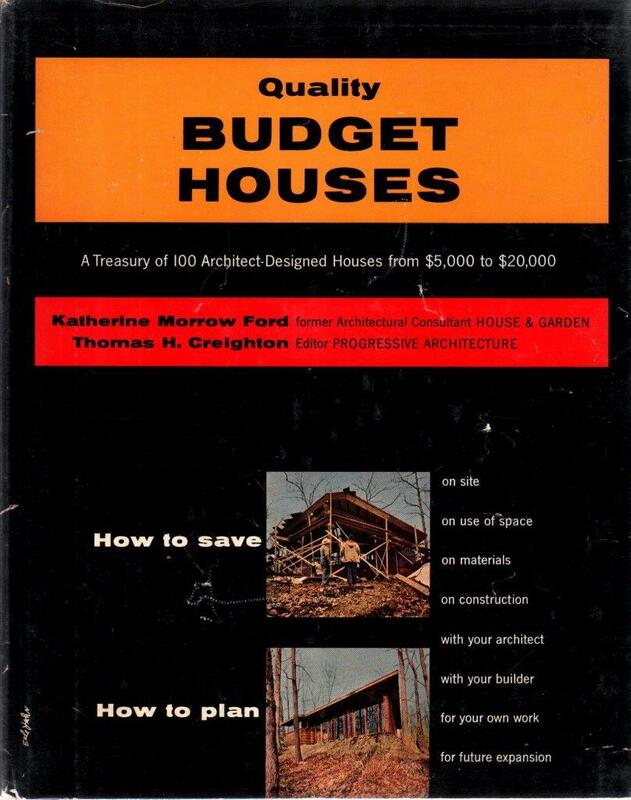 Quality Budget Houses by Katherine Morrow Ford and Thomas Creighton, Reinhold, New York, March 1954. "Katherine Morrow Ford probably knows more about the kind of houses people want to live in than anyone else in the United States. She and her co-author, Thomas H. Creighton, visit and study more houses in the course of each year than most people see in a lifetime. Mrs. Ford is currently Executive Producer of the television program "Living by Design." Besides this activity Mrs. Ford serves on architectural and design juries all over the country and in her spare time is a free-lance writer. Mrs. Ford has been concerned with housing problems since 1930. At various times in her career she has served as Head of Public Relations for Hans Knoll Associates, Architectural Consultant of House & Garden, and Executive Director of Better Homes in America. In private life Katherine Morrow Ford is known as Mrs. Thomas H. Creighton. Thomas H. Creighton is Editor of America's leading professional magazine, Progressive Architecture. Mr. Creighton, like his co-author, devotes a lot of his time to addressing meetings and forums to prove that architecture is important and that architects are human beings. This present book and his television program "Living by Design" bring his ideas to a wide audience. 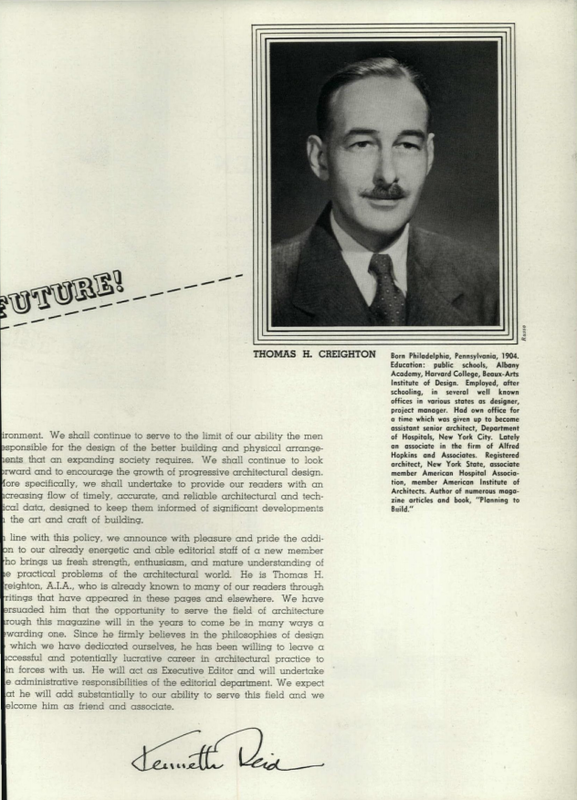 Before Mr. Creighton became editor of Progressive Architecture in 1946, he was an Associate in the architectural firm Alfred Hopkins and Associates. He also, at various times, was Senior Architect for the Department of Hospitals of the City of New York and a designer in various offices." 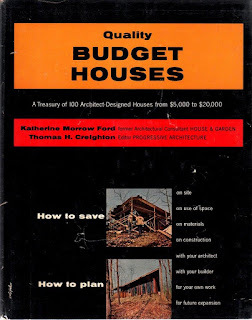 “This is a book about the things you have to know - and the things you have to do-to get a good, well designed and well built house on a limited budget. It tries to be a realistic book because the authors believe you are not interested in fantasy or wishful thinking. Let us suppose that you want a house of your own. You have been talking about it and dreaming about it and have saved a great file of clippings from magazines. But you cannot make up your mind, in the first place, whether you can afford it and whether it is wise; in the second place, you can't decide where to turn for advice and how to go about the preliminary steps of looking and comparing and studying." Katherine Morrow Ford and Thomas H. Creighton: Designs for Living, New York: Reinhold, March 1955. 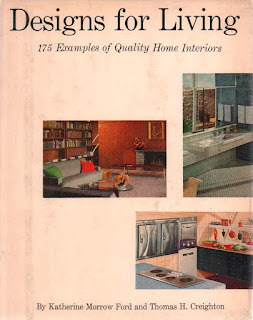 Katherine Morrow Ford parlayed her participation in the Designs for Living book and her television show of the same name into a national column by the same name which ran in the This Week magazine Sunday supplement from May 1955 until September 1957 (see below for example). Ford, Katherine Morrow, "Take a Plunge," This Week, Los Angeles Times, May 22, 1955, pp. 32-3. 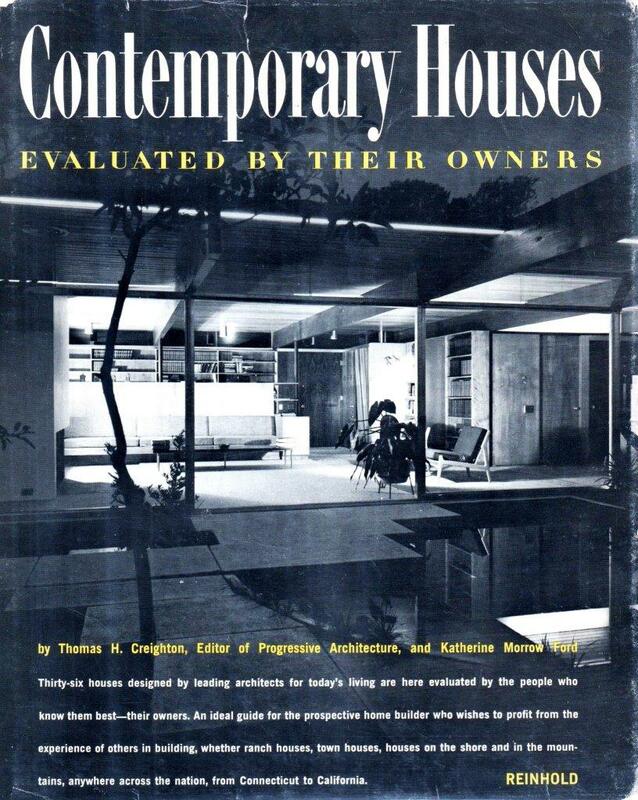 Contemporary Houses Evaluated by Their Owners by Thomas Creighton and Katherine Morrow Ford., Reinhold, New York, 1961. Katherine Morrow Ford's illustrious career as an author and reporter on modern architectural houses came to an end in 1959 when the 54-year old author was found dead in her Washington Mews home of an apparent overdose of barbiturates. ("Writer Found Dead," New York Times, June 27, 1959, p. 12). 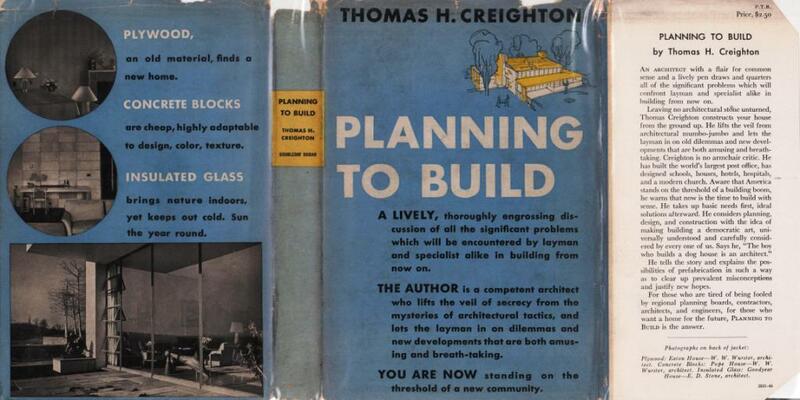 Apparently already under development, Contemporary Houses Evaluated by Their Owners was published under the byline of Ford and Thomas Creighton in 1961. Katherine Morrow Ford was an important author and chronicler of the modern house from the 1930s until her untimely death in 1959. 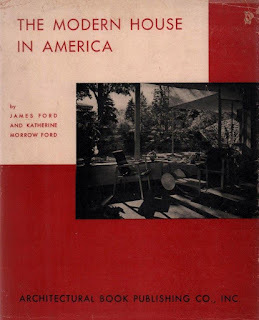 Extremely well-connected in both the East and West Coast modern architecture and design communities, Ford left a legacy of publication that will be difficult to match. For much more on Elizabeth Mock do a "Mock" search in my and Jose Parra's: "Lewis Mumford, Henry-Russell Hitchcock and the Rise of "Bay" Regionalism". For much on the interactions of New York's Museum of Modern Art under the curatorship of Elizabeth Mock and San Francisco's Museum of Art under the directorship of Dr. Grace McCann Morley do a "Mock" search in my and Jose Parra's: "Grace Morley, the San Francisco Museum of Art and the Early Environmental Agenda of the Bay Region (193X-194X)".